WINDSOR SQUARE HOME listed for $10.6 million. The sale of the landmark home on Lorraine Blvd. home in Windsor Square for $9.5 million (listed for $10.6 mllion) marks one of the highest-priced transactions in the area. The Beaux Arts style home was built in 1914 on property owned by Dr. Peter Janss and his son Edwin. The estate is a classic example of American Beaux Arts architecture. At its time of conception, the estate received notoriety for its design by renowned architects J. Martyn Haenke, William Dodd, and Julia Morgan of Hearst Castle fame. The Janss Investment Co. is noted for several subdivisions and development of UCLA in Westwood. Dr. Janss and his family only lived in the home three years, and sold it to William Russell. The Russells lived there 20 years, selling it to an attorney, Walter Tuller. Actor Lewis Stone, noted for his role as the judge in the “Andy Hardy” series, purchased the home in 1953. 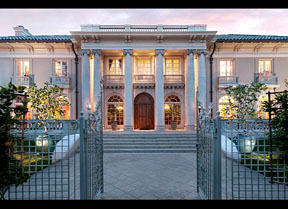 Following Stone’s death in 1961, Norman Chandler, publisher of the “Los Angeles Times,” and his wife Dorothy bought the house. Dorothy Chandler is best known for her fundraising efforts to finance a performing arts center in downtown Los Angeles. The result was The Music Center which includes the Dorothy Chandler Pavilion, Ahmanson Theatre and Mark Taper Forum. The estate, with a lavishly appointed music room and almost one-acre of grounds, was often the venue for her philanthropic passion which lead to it being registered as a Historic Cultural Monument. Listing agents were the Altman Brothers.